America is sick of bailouts. As President Obama called out in the State of the Union “we all hated the bank bailout. I hated it. I hated it. You hated it.” But the bailout mentality continues, and hate alone will not make it go away. So how can we end bailouts? “Make failure tolerable” is George Shultz’s answer, as he explains in the lead essay of a new book in which a dozen policy makers, economists, and lawyers delve into the problem and come up with answers. 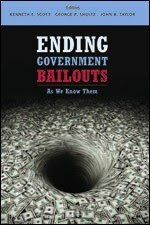 The book is Ending Government Bailouts as We Know Them and is edited by Ken Scott, George Shultz and me. You will also find Gary Stern, Peter Wallison, Monika Piazzesi, David Skeel, Ernie Patrikis, Bob Hall and many others critiquing . With the Obama administration’s bringing Volcker’s ideas into the spotlight and Congressional Republicans finding new support for their bankruptcy ideas, it looks like the book is as timely as it could be.